La maladie psychique est-elle une importation occidentale ? Joris Lachaise pénètre les murs d’une institution psychiatrique en banlieue de Dakar avec la réalisatrice Khady Sylla, plusieurs fois patiente du lieu, pour guide. Son projet est ambitieux : faire à la fois le portrait de l’endroit et de ses habitants, mais surtout interroger les différentes possibilités pour traiter les psychoses. De la plus traditionnelle à la plus allopathique, Lachaise sonde toutes les pistes de guérison et consulte surtout les patients, les prêtres, les marabouts et les médecins. Il réussit pleinement son pari dans ce documentaire passionnant sur le chaos mental. Joris Lachaise accompanies writer and filmmaker Khady Sylla to Senegal’s national psychiatric hospital, near Dakar, where she has been committed several times. Seeking dialogue, she meets the psychiatrist who treated her, familiar patients and other faces of the institution. An atlas of a strange place, a gallery of disconcerting characters, Ce qu’il reste de la folie (Grand Prix, French competition, FID Marseille) is a reflection on today’s Senegal, post-colonialism and its consequences – a country locked in perpetual struggle with its contradictions, where traditional healers and modern doctors try to work together. Using powerful, contrasting images, Lachaise delivers a tactful exploration of the underlying tensions in an oppressive environment. 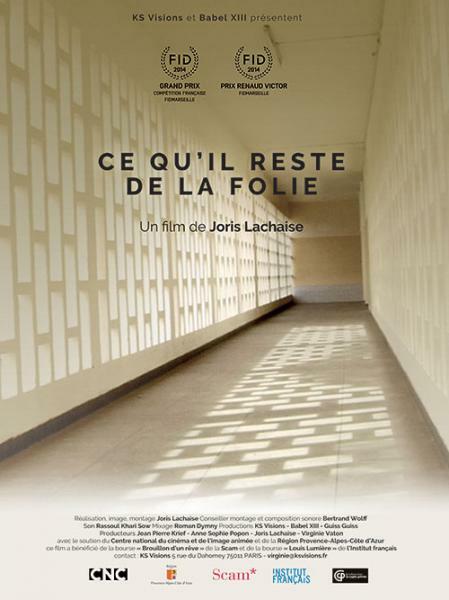 Joris Lachaise takes us to Thiaroye, in a suburb near Dakar, to enter the psychiatric hospital accompanied by writer and filmmaker Khady Sylla who has been admitted there several times. Khady Sylla (whose very beautiful film, Une fenêtre ouverte, was in competition at FID in 2005) meets up with her doctor, familiar patients and others with whom she discusses the delicate issue of therapeutic methods and their link with colonialism. The project is clearly ambitious, it combines the description of a place with portraits of beings marked by suffering, it blends the spectacle of different types of care (religious, traditional, modern) with considerations concerning the multiplicity of such care since we are present during discussions between marabouts and modern doctors about the possible coexistence of their practices. What remains of madness? Anything but meagre remnants: chaos, an uproar of silence and diatribes, a disturbing world where every- thing remains to be deciphered.